#ARTCONNECTS MEDIA — STEAM Co. This page contains some of the great media coverage we have had and some of the more popular Social media content we have produced and video clips, etc you can use to create your own posts. We get a lot of RT's but who really sees them? 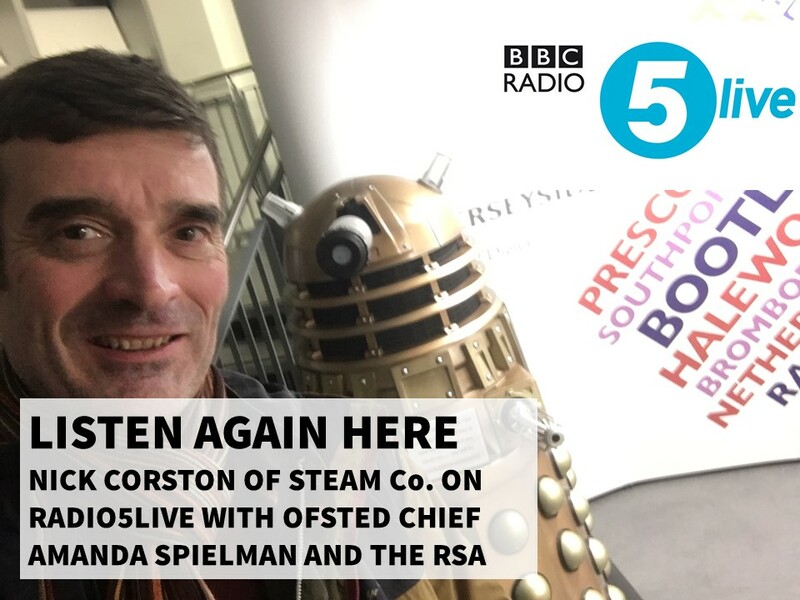 Nick Corston of STEAM Co. discusses BBC research into declining arts education with RSA and Headteacher. 90 second film with footage from BBC Question time of teacher and David Cameron Policy Adviser questioning our approach to testing. Bill Gates shortlists Andria Zafirakou, Art Teacher at Alperton Community School in Brent for the million-dollar Global Teacher Prize. Schools' Minister Nick Gibb refuses to answer 9x8 on national TV, saying a children wouldn't be asked to do it. or woudl they. The child in question here, attends Parklands Primary in Leeds whose Head Teacher Chris Dyson is keynoting at our event. Article talking about various STEAM Co. projects and how they have fostered massive community engagement. One case study in Luton saw over 150 parents come in to a primary school. A free day of Talks, Performances and Workshops for Parents, Teachers and Artists who say we should put Creativity First in Schools, Work and Lives to help our kids. << Helping Parents understand the skills their kids will need to thrive against the robots and artificial intelligence. << Shining a light on the UK's world class Creatives and creative industries as career pathways for our children. << Talk by the leader of the Camden STEAM Commission working to help our children get the high tech jobs that are now coming to Camden. Free tickets available for local community members, though donations gratefully received. We also have a Creative Education film screening and debate at the British Library on the Friday evening.